It’s the shameless dishonesty that irks people, the never-ending economy with the truth, the incessant misrepresentations. Julia Gillard cannot even bring herself to call carbon dioxide by its proper name, maliciously and deceitfully labelling it “carbon pollution” in a deliberate attempt to mislead and confuse the Australian public. It is not elemental carbon that is being taxed, it is the gaseous compound carbon dioxide, and it is not a pollutant, it is a harmless trace gas essential for plant life. If she is unable to tell the difference, she is not fit to be an MP, let alone the Prime Minister. If she lies about the one thing that is the VERY SUBJECT of her tax, how on earth can people trust her on anything else? “Why did you lie to us and why are you continuing to lie?” one woman said. 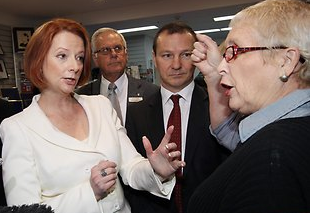 Gillard: “I can give you an answer right now if you’ll let me [note the snarky tone as well – Ed]. What I want to do is put a price on carbon pollution. The big polluters are going to pay. And that’s exactly the point. Gillard and her team think we are stupid, that we won’t be able to see through the spin and propaganda and think for ourselves. Treat the electorate with contempt and you will surely be banished to political oblivion at the first opportunity. Which aspect of Labor’s proposed ‘Carbon Tax’ is worse? Is it the fact that PM Gillard lied about it to get elected (‘there will be no carbon tax’); or the supposed rational that ‘carbon’ (shorthand for man-made carbon dioxide) is a pollutant (it definitely is not); or the covert intention to tax us more and sneak in more socialism (copying cot-case Europe); or that at best this massive tax will lead to an infinitesimal change in global warming; or saying Australia should lead the world (they’ve got to be joking); or saying the largest emitters of CO2, USA and China, are also cutting CO2 (they’re not); or the likelihood many of our exporters will be disadvantaged (hugely)? Or even that history is being ignored: all nations whose governments tried to subjugate their citizens failed. No, the worst aspect is the Labor government suggesting we tax payers are stupid. Someone ought to ask her to define “Carbon Pollution”…. that wuld almost certainly lead to a deceit of the most monumental order…. or a complete evasion of the issue. Either would be par for the course with this b—h ! Couldn’t quite say the ‘b’ word here? The level of animosity – from BOTH sides – regarding this issue leads me to believe that we should be more concerned about the deterioration of basic civility, rather than this misguided tax. Lies and political spin … when are these Labor/Green/Independent politicians going to wake up to the fact that Australians have had a gut full of both. Have you heard the latest theory on CO2 that is now causing global cooling? http://en.wikipedia.org/wiki/Shutdown_of_thermohaline_circulation I saw the end of a documenatary on this very subject on the Discovery Channel. So we have gone from AGW,to climate change and now to cooling caused by CO2.Can all these theories all be right ? Their whole scenario is a laughable farce. It’s a shame the rest of it isn’t there – on the news the woman signed off with ‘when you stop lying, then I’ll start listening’. Just about sums it up in a nutshell. I only caught the end of the 7pm project but I notice they all looked a bit shocked to find Tony Abbott an articulate humble man, and not some raving mad sexist lunatic as many people try and paint him as. Like that makes a difference! These fools just don’t seem to get it – a lie is a lie is a lie. In a democracy when government exists via the process of elections,they attain the keys to office not power.I guess when they lose sight of this fundamental regardless of the situation people start getting a little pissed off.Reap the whirlwind Juliar! The PM and her Green cronies need to be told by a a lot more people, in a polite, but firm way, that they disagree with her actions, and question her motives. Even if it makes 1 more person think about it in more detail, it’s worth it. I’ll be there, front and centre if any of them, and I are ever in the same city at the same time, as should anyone who disagrees with this monumental disaster of a wealth redistribution scheme. No name calling, no jeering, just sensible, direct questions, followed by, an “I’m sorry, I’m not satisfied with your answer, can you try again” when they inevitably say how ‘Carbon Pollution is bad, tax is good’. Last night at the People’s Forum, it seems Julia actually won over some people. Of the 112 people who cast their vote as they entered the forum, only 23 people, a mere 20.5 per cent, said they were in favour of the carbon tax. Another 42 people said they did not support the tax, 47 said they were undecided and another five did not cast a vote. On the way out of the room, support for the carbon tax had doubled to 41 per cent. I really cannot understand this, I watched the forum last night, and all I heard was the same old spin. I never thought I’d live to see an Australian government worse than the Whitlam government and yet with Rudd and Gillard, Whitlam is now only the third worse PM this country has ever had. The observation ‘harmless trace gas’ is, I believe, misleading. To the extent that CO2 remains merely a trace gas you are correct – it is harmless, and for plants beneficial. However, the real issue is to what extent we as a species are turning that trace gas into one that is more abundant in the atmosphere. The worry by many, deluded or otherwise, is that the Earth will end up on the same path that Venus followed in regards to the contribution that this particular gas makes in trapping ultraviolet and other forms of solar energy, and that as a result of this we are, or will, contribute to turning this planet down a similar path (the ‘hothouse’ scenario). Yes, environmentalists make some stupid comments sometimes, and the introduction of a tax will have zero value if we make the assumption that the alarmists are 100% correct (which is extremely unlikely), but it nevertheless is a fact that heat can be, and is, trapped by the gases that comprise our atmosphere (the ‘greenhouse effect’ is real, established science you know), for it is openly acknowledged that if it were not for this effect the Earth would have an approximate mean temperature of minus 20 degrees C. How long our contribution of CO2 could make to warming the earth no-one really knows (i.e. there is no accurate timetable or forecast), and the ‘tipping-point’ hypothesis is, as far as I know, at this time purely speculative, but the manner in which greenhouse gases behave in our atmosphere, and the contribution those gases make towards keeping the Earth warm, are not in doubt. When environmentalists say ‘the science is settled’ I now assume that they have these very basic facts in mind. We have gone from 290ppm pre-Industrial to 390ppm today. If we burnt ALL the fossil fuels on earth it is unlikely to reach double that figure, say 800ppm. So we have gone from 3 hundredths of one percent of the atmosphere to 8 hundredths of one percent. It is still a harmless trace gas. CO2 only becomes toxic between 5 and 10 thousand ppm. The “science” says that a doubling of CO2 will cause less than 1 degree of warming, and the warming effect decreases logarithmically as concentration increases – the majority of warming arises from the first 60ppm. Everything else (forecasts of 4 – 6 degrees) is the product of computer models. The Venus comparison is totally misleading because Venus is so geologically and atmospherically different from Earth. Yes you are right that the “science is settled” claim relates to the theory of greenhouse warming (which nobody here would challenge) but it is used in such a way as to indicate that there is no uncertainties regarding the sensitivity of the climate, which is utter nonsense. Even the IPCC admits its level of scientific understanding of many forcing factors is low or very low. Could I have the source for the figures quoted here? Yes, Venus is very different in many respects, but there are similarities (ex. similar mean distance from sun, similar mass and size) as well, so I wouldn’t say that the comparison was totally misleading; I was simply acknowledging that there are those who are concerned that we could be headed down a similar path. I myself don’t believe so, but others do, and this would account for some of the hysteria, which is the point I was trying to make here. Yes, that unfortunately can be traced to a combination of media sensationalism with a poor understanding of basic science by the general public, which I mentioned before. More people should actively question EVERYTHING they hear, but too many don’t, and that is just inexcusable. One other observation. The incompetence of the current government regarding this important issue is, I believe, due to, among other things, the steady deterioration in the understanding of (very basic) science by the general public in this, and other, countries. It makes me wonder whether the sciences are even taught in schools anymore, and this may account for (some) of the very bad advice Julia Gillard has no doubt been receiving.